R. Kolewe. Afterletters (BookThug 2014). This is a stunning first book by a writer previously unknown to me (well, he was educated in physics & engineering, & had a successful career in the software industry — during which time he obviously did what few engineers do: read widely, not least modern poetry). 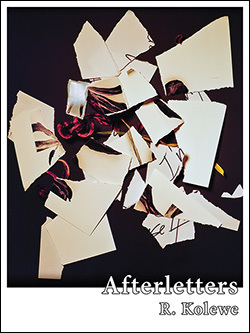 The title, Afterletters, is full of implication, not least the inventive wordplay Paul Celan constructed throughout his oeuvre. In Afterletters, Kolewe takes up Celan’s well-known parsimony with language, his ability to compress so much in a single small poem, to construct a short lyric suite based on the more than two decades long, mostly epistolary, relationship between Celan & Ingebord Bachmann. As his Notes make clear, Kolewe has read both writers’ works as well a their correspondence, much of it in the original German. And he has extracted bits & pieces from these writings, cut & folded them into his own (anti-)lyrics to construct a compelling underground narrative of unavoidable loss. Or losses: those they endured before meeting, those that their psychological burdens of memory made impossible to avoid once they had met & connected. As the series of found sentences from both in ‘Decorrelation’ demonstrate, managing to cover their whole long relationship in one short acidic burst. Indeed, Afterletters is an odd addition to both the genre of the found poem & that of the Canadian documentary poem, yet it refuses to lie quietly in either format. In so far as it quotes the poems & letters of Bachmann & Celan, it offers a kind of documentation of their long relationship, but because it only quotes fragments, & juxtaposes them for their impact in a particular poem, it refuses any attempt to lay out either a full narrative of their lives or any analysis of their relationship or individual psyches. And even when it quotes one of them directly at some length, that quotation becomes part of Afterletters, an anti-lyric suite more fascinated in what language can do (& perhaps did to & for these writers) than in anything as banal as mere biography. So a poem like ‘After a quiet year, this October’ can begin with a(nother) reference to stars (the word or its synonyms appear in many of these poems, as it did in Celan’s work): ‘Every star is numbered. / Let me count the ladder steps from here. / Let me say I saw you climbing up / into the lead-grey constellations…’. It can then obviously quote Bachmann before slipping into reverie, & then seemingly continue that, while actually quoting once again: ‘Half an hour has passed since / the first sentence, and last autumn /is forcing its way into this autumn.’ But that quote is now in English, & the line breaks work to force multiple readings for us English readers. Kolewe achieves such subtle formal play throughout, insisting that the writing (often of not writing) is the core of what he’s found in these two writers’ correspondence: ‘Writing I can understand that you / are not writing to me cannot write / will not — the flow parted / in the letters before I was / nothing is missing just / the ink for this and I can live.’ How these lines keep demanding ever renewed parsing by the reader is a major part of the pleasure the offer. Although the notes allow us to see what Kolewe has taken from each writer for each poem, the double complaint of ‘Objects retreat from their qualities’ ‘A’ & ‘B’ argues that something as simple as I-dentification is precisely what Afterletters seeks to undermine. What is written, not who wrote what, that is what counts here. And while we might agree with whichever of them says, ‘I wish you’d told me more,’ in fact Afterletters tells all it needs to, & is telling indeed. Oh, & about those stars: the final poem presents a list (the note says is taken from a study of Celan’s use of the term up till 1967, a gloriously lyrical evocation of ‘any one place at midnight.’ This is what Afterletters does: it shows us that words count (& that counting words carefully makes for the most concise beauty, even if it’s only the beauty of loss).